The choices we make don't just effect what we do today. They effect tomorrow. To us, building 'green' isn't just a cliche - it's just good business. At Blue World Crete, all of these concepts go hand in hand with helping you become a better builder. As stewards for the environment, we’re passionate about improving the world we live in…. Set new standards for green construction. 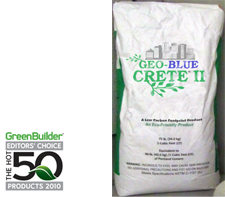 Blue World Crete’s high-performance, lower-cost, low-carbon cement, gives you and your clients the power of one of the most environmentally friendly building materials, ever! Create & promote facilities that are more responsible and sustainable places to do business. Learn more about how professionals in your field can leverage the power of Geo-Blue Crete. © 2013 Blue World Crete, Inc. | All Rights Reserved.